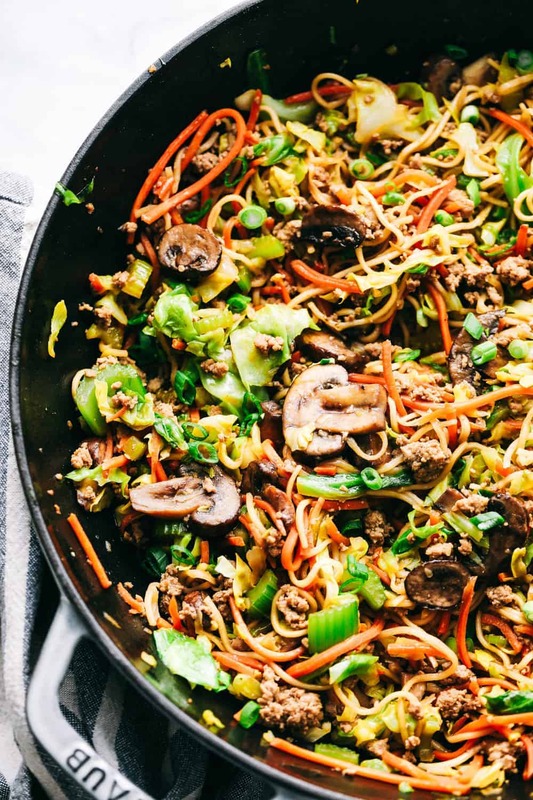 Egg Roll Noodle Skillet with Ground Pork is filled with tender bites of ground pork, soft cabbage, crunchy carrots and celery mixed together with ramen noodles to make this meal light and filling! The vegetables and noodles are coated with a sweet and spicy sauce that is full of flavor. This is all blended together in one simple skillet meal! If you are looking for more recipes that are quick and easy to make during the week try this Asian Turkey Lettuce Wraps, Turkey Stuffed Peppers or Smoky Paprika Fish Tacos with an Apple Slaw. Egg rolls are a favorite at our house! Imagine unwrapping an egg roll and taking the vegetables and protein out helps make a healthier and lighter meal that tastes just as great! Simple to make within minutes and an easy clean up! Kids and adults love the flavor and enjoy how delicious this meal is when it all comes together on a busy weeknight. This is a Must Try meal that will be approved by all ages. Watching my weight and continuing on my goals for the New Year, I love how flavorful this meal is and how I can make it ahead for a meal prep for the week. The vegetables give the perfect texture that blends well with the ground pork and noodles to make a crunchy, soft and chewy meal that is satisfying all day. 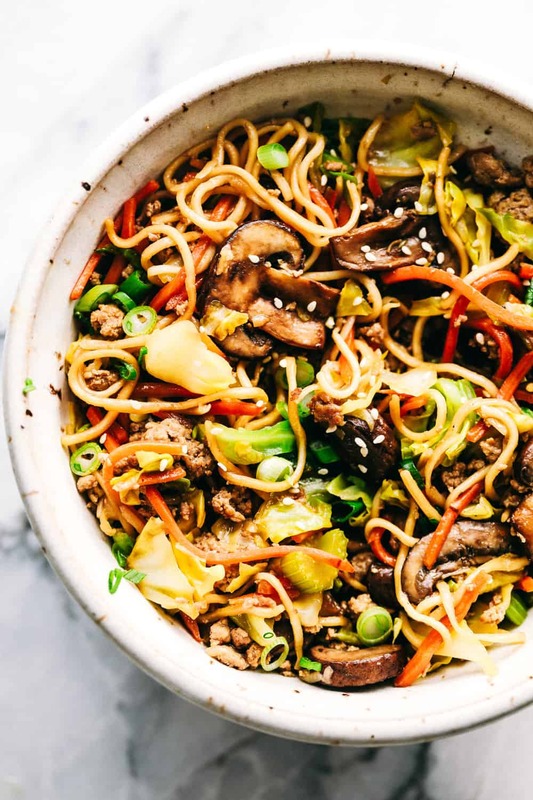 Minutes is all you need for this wonderful Egg Roll Noodle Skillet. Be amazed at how quickly this meal comes together and even makes the best meal prep for your busy week. Still working hard towards those weight loss goals, this noodle skillet comes together easy and quickly while still having early mornings, family activities, and work schedule while keeping your goals in mind. In one skillet, this all comes together simply and makes a colorful, unique blend with a touch a spice and sweet sauce that makes this meal irresistible. 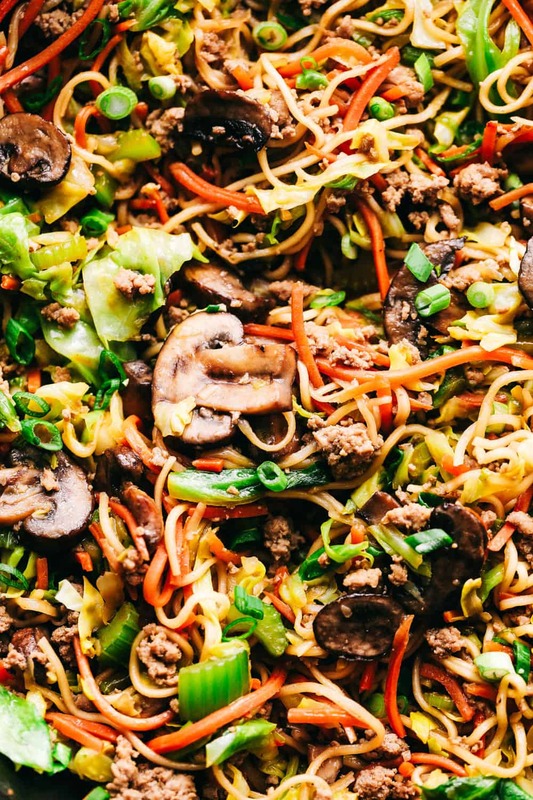 How do You Make Egg Roll Noodle Skillet with Ground Pork? In a large skillet add the sesame oil over medium high heat. Add the pork and cook and crumble until brown. Add in cabbage, carrots, celery, mushrooms and cook for about 4-6 minutes until vegetables are tender. Cook the ramen noodles according to package directions. Drain and add them to the skillet. Add the hoisin sauce, rice wine vinegar, and chili paste and mix until heated through. Garnish with green onions and serve immediately. What are the best noodles for this Egg Roll Noodle Skillet? Want more Oriental recipes? Enjoy these ones! I have made many of Alyssa’s recipes and this one is truly a keeper! It’s super easy and healthy. I did as the recipe but omitted the chili paste just in case my 2, 3, and 9 year old wouldn’t like it. I was blown away that my girls were eating celery and cabbage (1st time) without really disguising it! I did have to add a little more hoisin sauce on their plates to make it more sweeter for them towards the end. Thanks so much!